A host of the finest peppers from around the world. A Little Devil's Envy adds Lots of Flavor! A blend of 5 hot peppers and garlic that gives an awesome 2 stage heat with an amazing flavor. Sweet onions, cilantro, parsley, oil and vinegar smooth the heat leaving you with a flavor experience that keeps you coming back. Goes with many different food dishes. Use it as a condiment. Great on eggs, hot dogs, black bean burgers, fish, casseroles, grilled veggies and meat, or anytime you want to add a little zip to your meal. 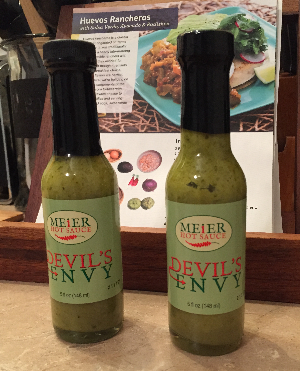 Use as a base for creating a great green chili, pasta salad, chip dip, or salad dressing. Let your imagination run wild. Add some lime juice and avocado for real zing! Serve it as the final touch to your favorite BBQ meat!